Snowy powderpuff balls filled vines and branches after wind and snowfall this week. Frigid temperatures kept me to only one walk this week – and I left with almost no photos when my fingers got too cold to feel the camera’s shutter button! 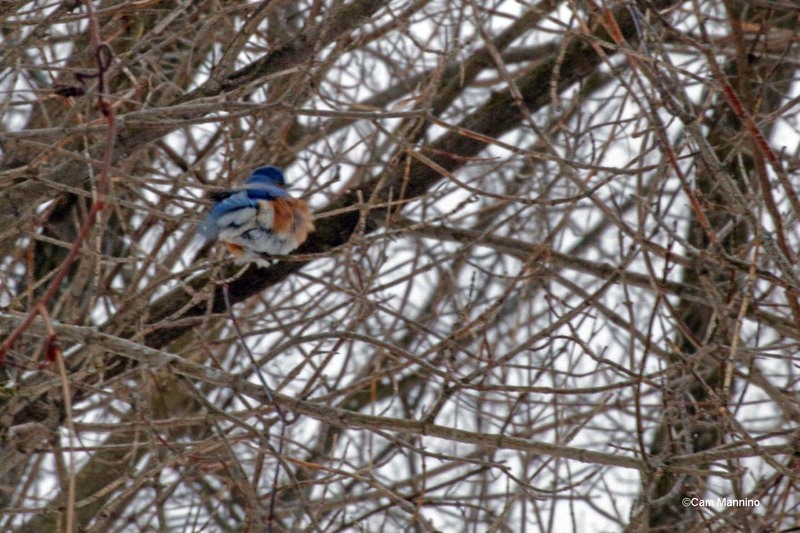 I did see a poor Eastern Bluebird facing south, his fluffed-up feathers blowing in an icy north wind! 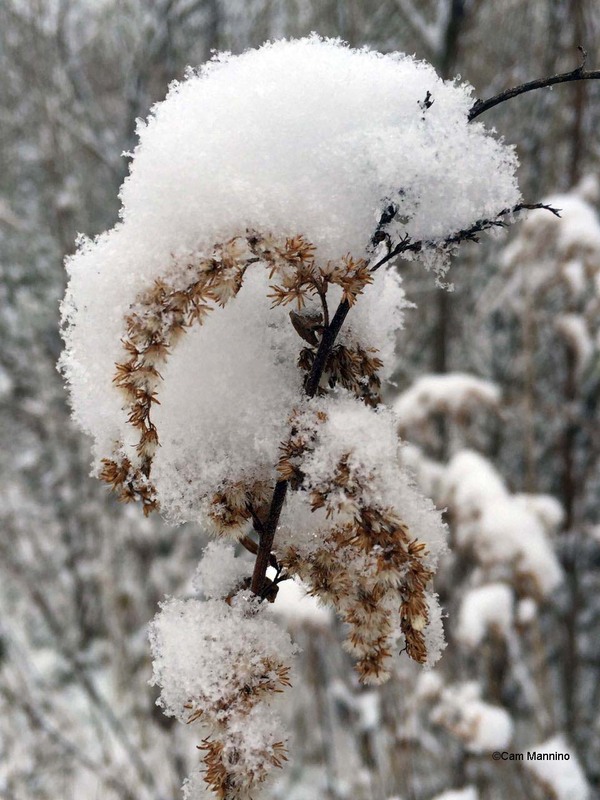 As I trundled along past brown and bending Queen Anne’s Lace and Canada Goldenrod, filled with powderpuffs of snow, it occurred to me to wonder about how plants and their seeds experience winter. Luckily Stewardship Manager Ben VanderWeide lent me some books about seeds, so I curled up with them and started exploring. Here are the questions I wanted to answer: Where are seeds now? How do seeds get to where they are now? How do seeds know when to “wake up” and germinate? Plants have varying life spans so they have adapted to pass on their DNA in a variety of ways. Wild annuals, short-lived plants, the kind that bother many gardeners as “weeds,” produce abundant seeds that end up in soil seed banks. 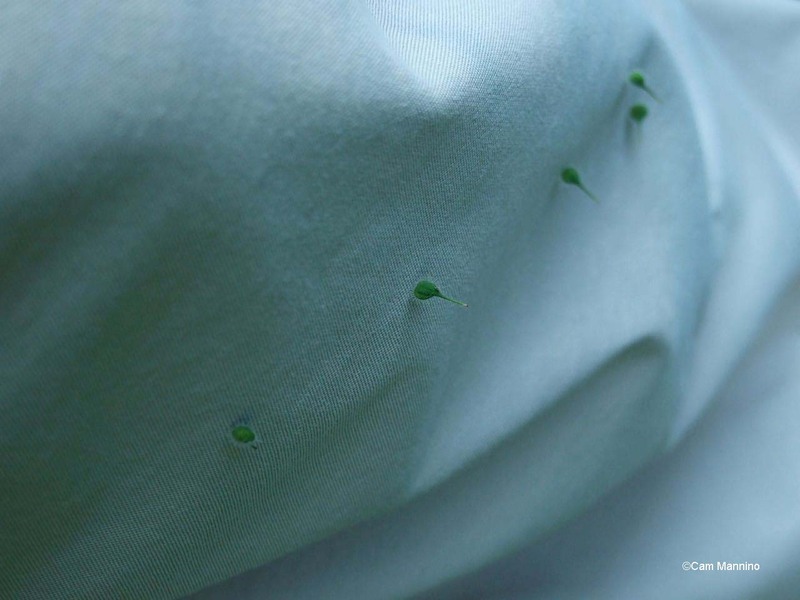 “Each seed is dispersed in swaddling clothes of maternal tissue.” The “mother plant… can program the layers…to germinate soon or later, and she often goes for a mixture within her brood.” Some will take longer than others to break out of their coatings and germinate, giving the mother plant more chances to produce successful offspring. As Silvertown says, “A seed only ever gets one shot at germination so it must get the timing right.” With a variety of germination times, if the conditions in a particular season aren’t good for germinating, some seeds will stay longer in the seed bank, giving them a chance to germinate in more favorable conditions. Anyone who’s weeded a garden has dealt with some of these annuals that come up out of the seed bank year every year! Some of our annuals are non-native plants like Common Sow-thistle (Sonchus oleraceus) on the left below and some are native plants, like Fireweed (Erechtites hieracifolius) on the right, which waits in the soil until some disturbance exposes the soil surface. Some of our native wildflowers , like Black-Eyed Susans (Rudbeckia hirta) are biennials. They usually spend their first year producing roots and rosettes (leaves and a short stem) near the ground. Their roots winter over and the second, or sometimes third year, they grow, bloom, are pollinated, make seeds and die. Biennial Black-eyed Susans bloom their second year. At the end of the second year, they make seeds and the plants die. Most of our native wildflowers, though, are “herbaceous” perennials. For herbaceous perennials the aboveground structures die back in the fall. But underground, their roots, tubers, rhizomes or bulbs survive the winter in the earth and the plant rises from them again the following year. Some, like the Yellow Cone Flowers (Ratibida pinnata) below left also produce seed, carried away by Goldfinches, for example. Woody plants, shrubs and trees like the mighty Oak (Quercus sp.) below right, are perennial plants too, since they live much longer than one or two years. Of course, unlike herbaceous perennials, the aboveground structures of woody plants remain out in the weather year-round. Living cells in the branches and trunk are protected by a sweet “anti-freeze” that trees create in the fall. 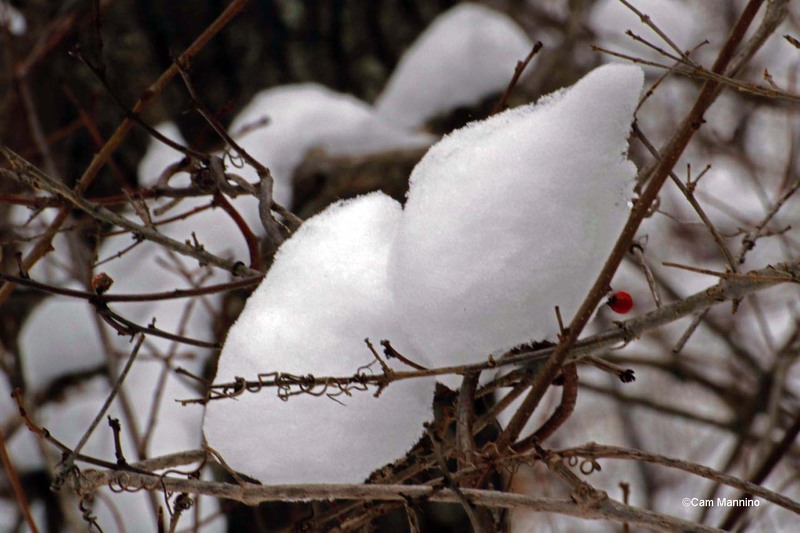 Dead cells, which make up most of the visible tree, can freeze without harm to the tree. 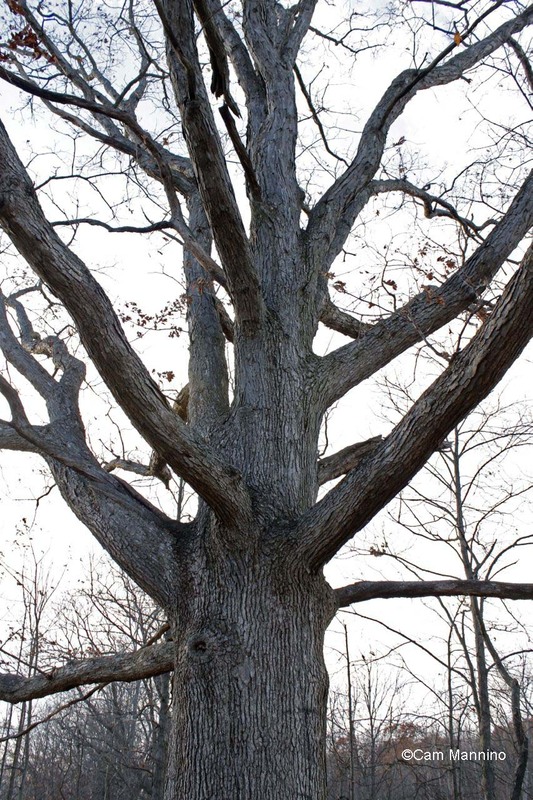 A mighty red oak can also be considered a perennial plant. How Did Seeds Get Where They are Now ? Plants have adapted a lot of strategies for dispersing their seeds to the relatively safe haven of the ground before winter arrives in our neck of the woods. Beautiful Wild Columbine (Aquilegia canadensis) drops its shiny black seeds from the follicles that form after the flowers. Such tiny seeds can simply slip into crevices in the earth and be planted by gravity. Wild Columbine grew on a hill east of the park in the 1940s. Tiny columbine seeds fall into crevices in the ground and are buried. 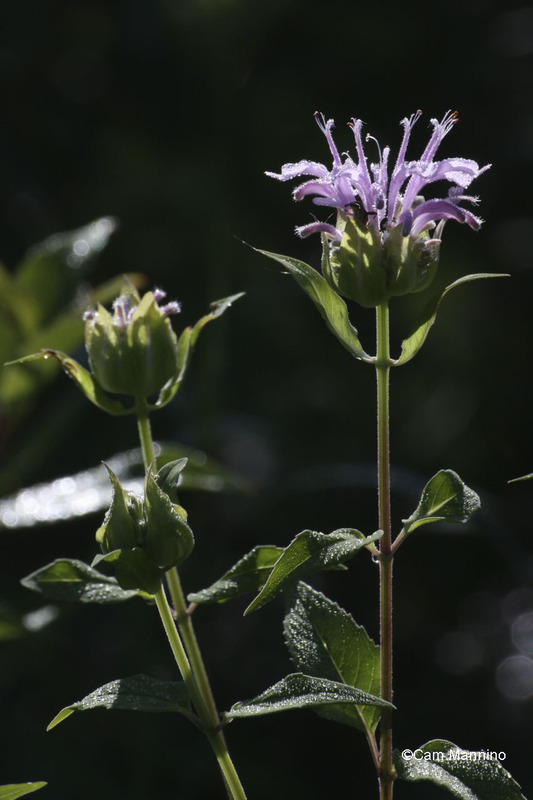 Some, like Wild Bergamot (Monarda fistulosa), have two strategies. Along with producing tiny seeds, they also grow in clumps by extending their rhizomes, underground stems that produce new roots and shoots. Wild Bergamot reproduces through dropping its tiny seeds to the earth and by extending rhizomes under the ground. 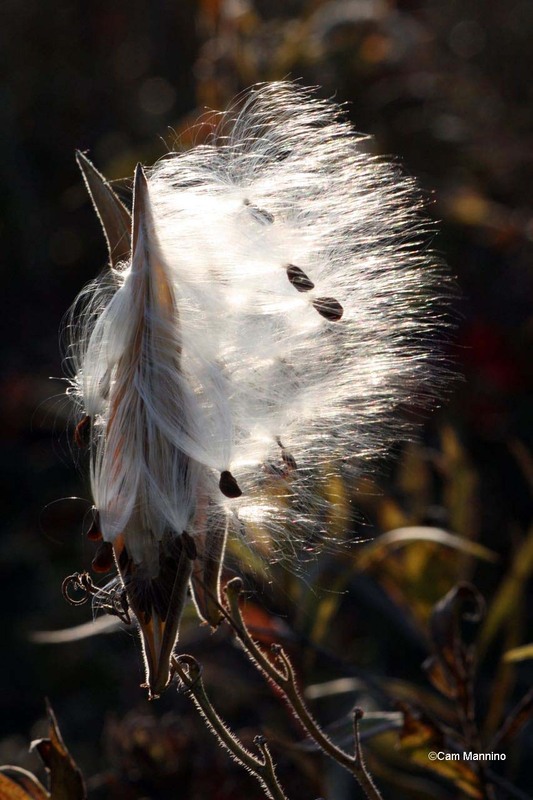 Some of the Monarch butterfly’s favorite plants, the Milkweeds (Asclepias species), rely on rhizomes too but they also disperse their seeds in a way that children love, by sailing them on a breeze with an attached parachute called the coma. The advantage of using the fluffy coma is that the plant’s offspring can spread out and not crowd the area where the adult plant grows. Butterfly Milkweed sending its seed off into the wind. Some seeds have built-in wings, like the Wingstem seeds (Verbesina alternifolia) on the left below. Dr. Ben collected these seeds this year for the Oakland Township seed bank that he keeps stored in a cool, dry place. They’ll be planted in the township parks later this year. You can see the Wingstem plant at this link. Some seeds of trees, called “samaras, ” also come with wings that spin them through the air, slowing their fall and increasing the distance they can travel from the parent tree. 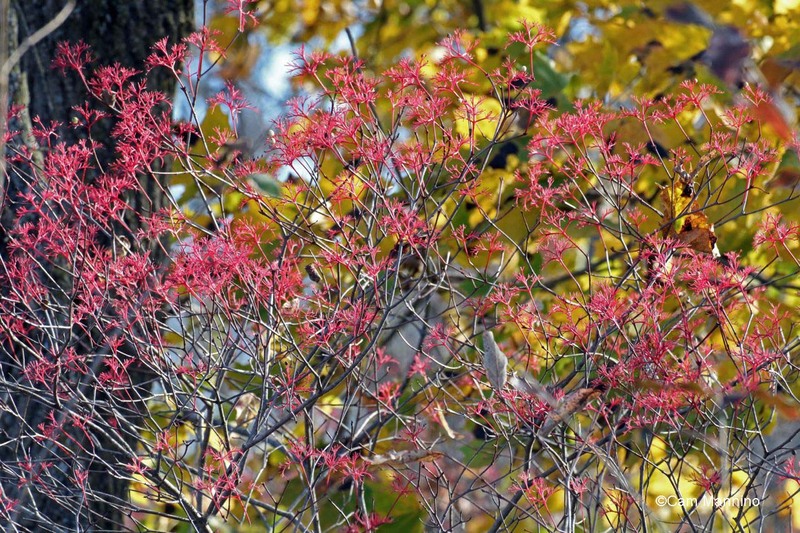 The samaras in the center photo are from Box-Elder (Acer negundo), a member of the Maple trees. Some grasses and other larger seeds come equipped with bristles called “awns” that function like feathered darts, sticking up out of crevices after they fall or are driven through the air like arrows. On the right below is a pretty wild grass with awns called Canada Wild Rye (Elymus canadensis) that grows in our township parks. Some awns twist when the humidity changes, drilling the seed into the ground. Wingstem seeds glide through the air. Box-elder seeds are samaras that spin through the air. Canada Wild Rye seed is dispersed by awns that function like darts. Frequently, plants rely on animals to disperse their seeds. The Violet below, which I think is a Common Blue Violet (Viola sororia) – there are 28 Violet species in Michigan! – uses ants to disperse its seeds. Violet seeds have a “fatty wart” attached. Ants haul it into their underground nests for food. 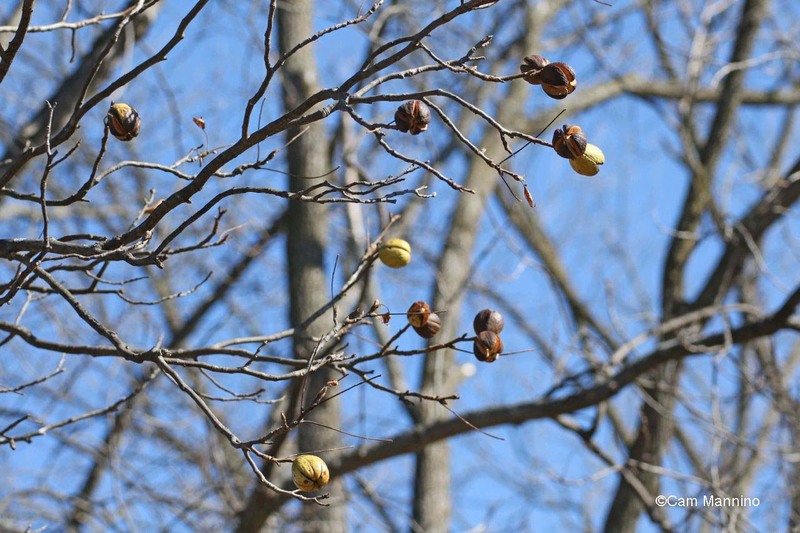 Once the “wart” or elaiosome is stripped away, “the ants dump [the seed] …on a trash pile where it can germinate…hidden from predators such as birds.” Big oak seeds, like the Bur Oak acorn (Quercus macrocarpa) below on the right, benefit from the tendency of Gray and Fox squirrels to bury nuts and then forget where they put some of them! 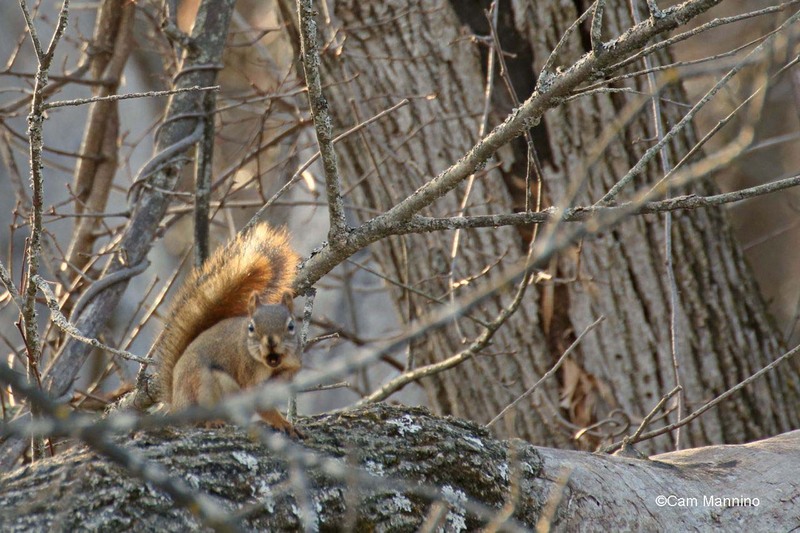 The fuzzy acorns of the Bur Oak may be buried by squirrels. 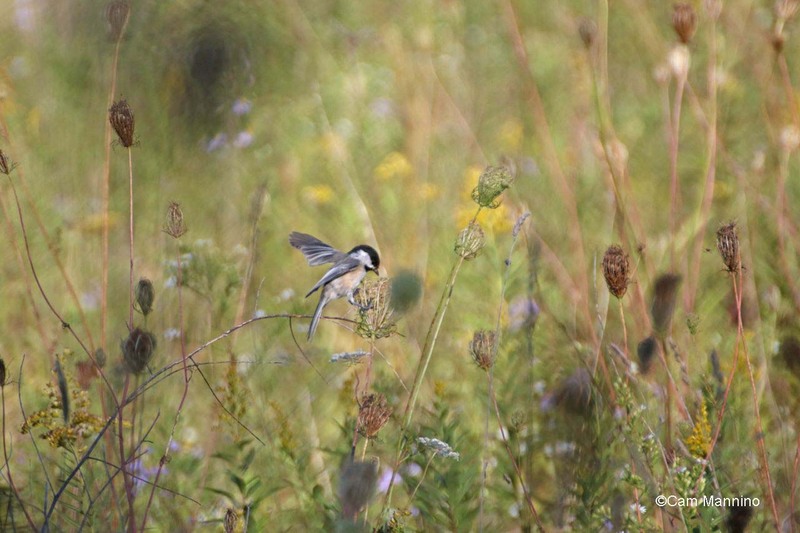 Birds, of course, carry all kinds of seeds, by eating them directly as the Black-Capped Chickadee (Poecile atricapillus)is doing below with the seeds of Queen Anne’s Lace (Daucus carota) or by eating fruits that contain them and depositing the seeds as droppings elsewhere. Chickadee feeding on the seeds of Queen Anne’s Lace. Other seeds hitch rides inside burrs that cling to feathers, fur or a passing human, like these seeds from Enchanter’s Nightshade (Ciraea canadensis) that got transported around Bear Creek on the leg of my hiking pants a few years ago. Burrs carrying the seeds of Enchanter’s Nightshade that hitched a ride on my clothing one summer. How Do Seeds Know When to “Wake Up” and Germinate? Seeds have adapted many ways of figuring out when to germinate. Seeds here in Michigan need to assess temperature, soil moisture and light to germinate. I could imagine how a seed’s coating might soften with moisture and that the warming of spring could trigger growth. But how, I wondered, do seeds “see” light? Seeds that end up on or near the surface, like Barnyard Grass (Echinochloa muricata) to the left, use light to make their move. 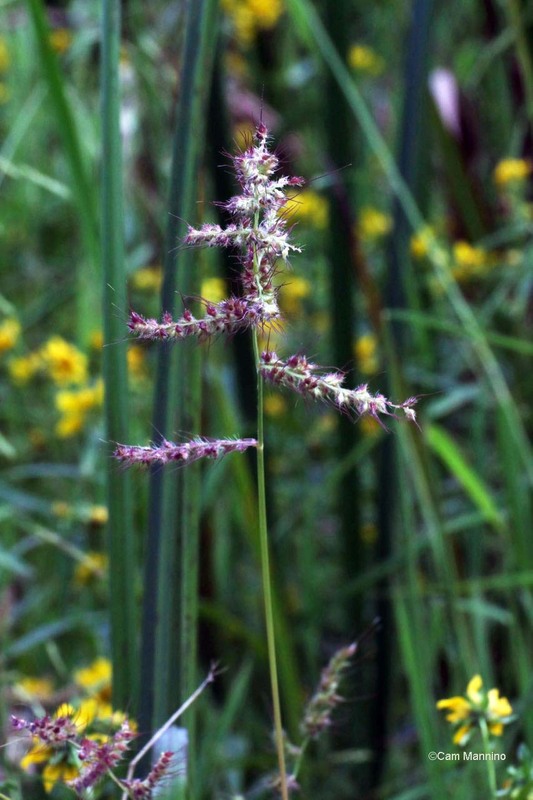 Barnyard Grass seeds that lay on the soil surface have molecules that can “see” sunlight. It turns out that molecules on the surface of seeds, called phytochromes, can read the length of daylight, which is often a better indicator of spring than the temperature. Not only that, they can read different wavelengths of light! So they can tell whether the sunlight is falling directly on the seed or whether it’s bouncing off a nearby plant that might compete for sunlight. Depending on what kind of light a seed needs – direct sunlight, partial sunlight or shade – it may start germinating or wait until the right conditions occur. Maybe a nearby tree needs to fall or a larger nearby plant needs to be eaten by an animal before the phytochromes can signal that the light is now right for germination – and then out comes a shoot! Amazing! Buried seeds, like acorns or violets, obviously can’t use light to determine the seasonal conditions. They are in the dark! But they can use temperature in surprisingly sophisticated ways! If there’s an insulating layer of grass above a plant, the range of temperatures in the soil will not fluctuate much. However, “bare soil has no such insulating layer and so seeds buried beneath it experience extreme fluctuations of temperature.” So seeds of sun-loving plants, for example, will wait to see if conditions improve if the temperature is not fluctuating much. Ones that experience lots of temperature fluctuation know they have bare ground above and may “decide” to germinate. Clever seeds, eh? This Canada Goldenrod, a native perennial, has dispersed its seed and also spreads by rhizomes underground. 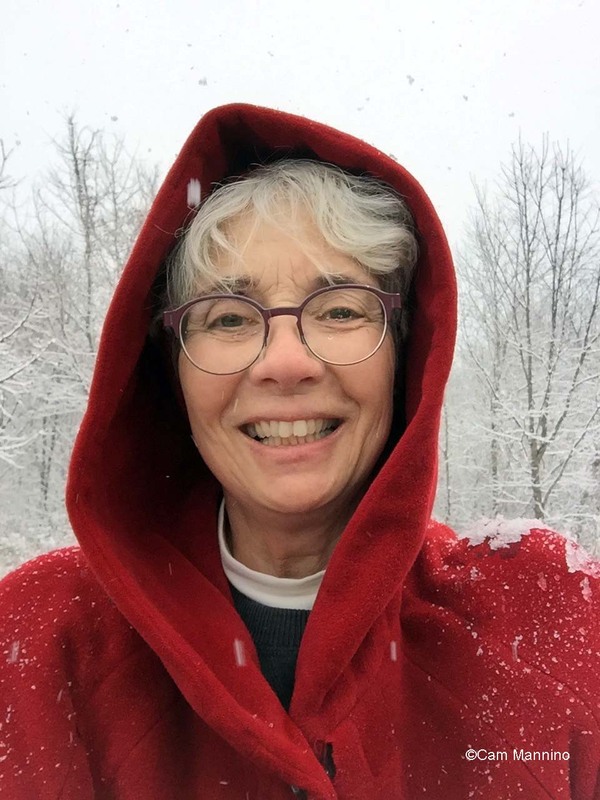 So like all the life forms we’ve explored together this winter – mammals, birds, reptiles, amphibians and insects – plants too have survival strategies for long Michigan winters. Now, when I watch Milkweed seeds fly by or Wild Senna pods cracking open to release their seeds, I think I’ll have a better appreciation of the magic inside those small packets of life. Footnote:  My sources for information are as follows: Ritland, D. B., & Brower, L. P. (1991); Stokes Nature Guides: A Guide to Bird Behavior Volumes 1-3, Allaboutbirds.org, the website of the Cornell Ornithology Lab at Cornell University; Wikipedia; http://www.butterfliesandmoths.org; Herbarium of the University of Michigan at michiganflora.net; various Michigan Field Guides by Stan Tekiela; Butterflies of Michigan Field Guide by Jaret C. Daniels; University of Wisconsin's Bug Lady at www4.uwm.edu/fieldstation/naturalhistory/bugoftheweek/ for insect info; http://www.migrationresearch.org/mbo/id/rbgr.html for migration info; invaluable wildflower identification from local expert, Maryann Whitman; experienced birder Ruth Glass, bird walk leader at Stoney Creek Metro Park for bird identification; Birds of North America Online; Audubon.org; Nature in Winter by Donald Stokes, Trees in My Forest by Bernd Heinrich, Winter World by Bernd Heinrich, Savannah River Ecology Lab (Univ of Georgia); Tortoise Trust website www.tortoisetrust.org;  An Orchard Invisible: A Natural History of Seeds by Jonathan Silvertown,; The Ecology of Plants by Gurevitch, Scheiner and Fox; other sites as cited in the text. and other native trees, shrubs and prairie wildflowers. During the spring and summer, ground-nesting birds like the Northern Bobwhite Quail (Colinus virginianus) settled among tall grass stems, producing young. Bobolinks (Dolichonyx oryzivorus) sang their burbling song while swaying on grass stems. The Eastern Meadowlarks (Sturnella magna) whistled their slow song from perches in low shrubs. Later, in the 1800’s, non-native game birds like Ring-necked Pheasants (Phasianus colchicus) were introduced and took advantage of the tall grass for cover. 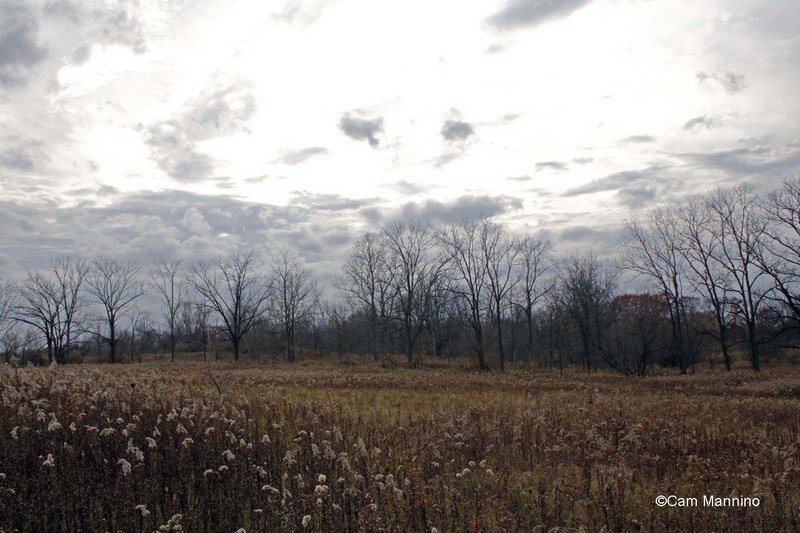 On November 14 and 15, Oakland Township’s Stewardship Manager, Dr. Ben VanderWeide, took a huge step forward in prairie restoration on 20 acres of Draper Twin Lake Park and another 18 acres in Charles Ilsley Park. 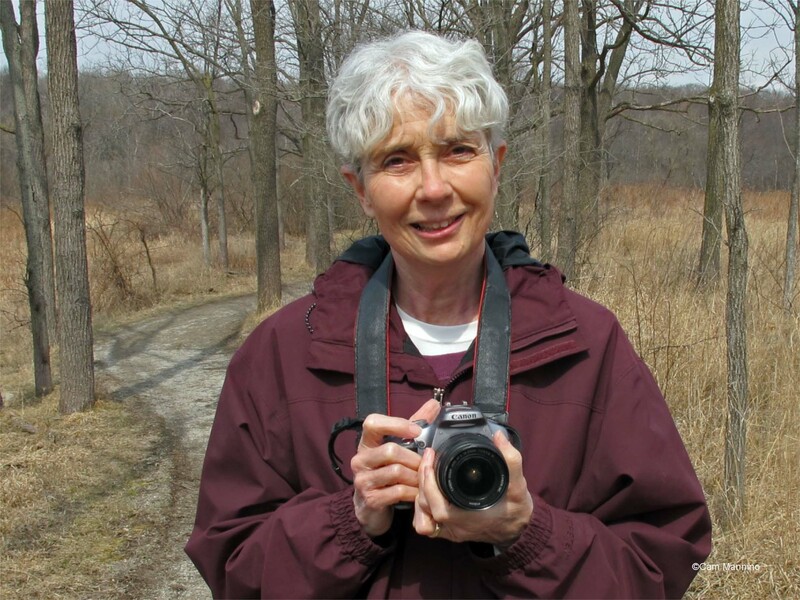 The hope is that residents will be able to experience the land as it may have looked before and that native residents – birds, animals, grasses, wildflowers, shrubs and trees of the prairie – can return, adding more rich diversity to the plants and wildlife of Oakland Township. 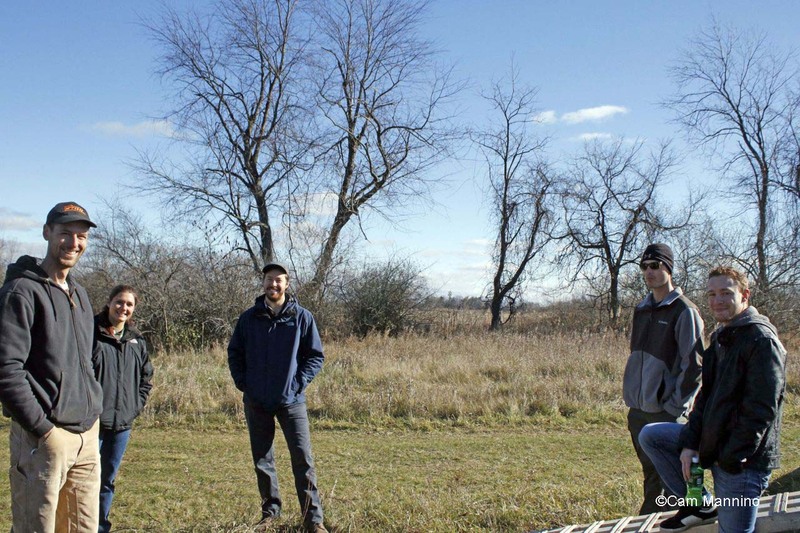 The process began in the summer of 2014 as crews working with Dr. Ben began removing the non-native and invasive species that had taken over the land after farming had ceased. This meant long hours of cutting woody invasive trees and shrubs like Autumn Olive, Multiflora Rose and Glossy Buckthorn which had quickly colonized the open land, and then treating the stumps to prevent re-growth. The process continued this summer until one beautifully rolling 20 acre field was finally prepared for planting in Draper Twin Lake Park. 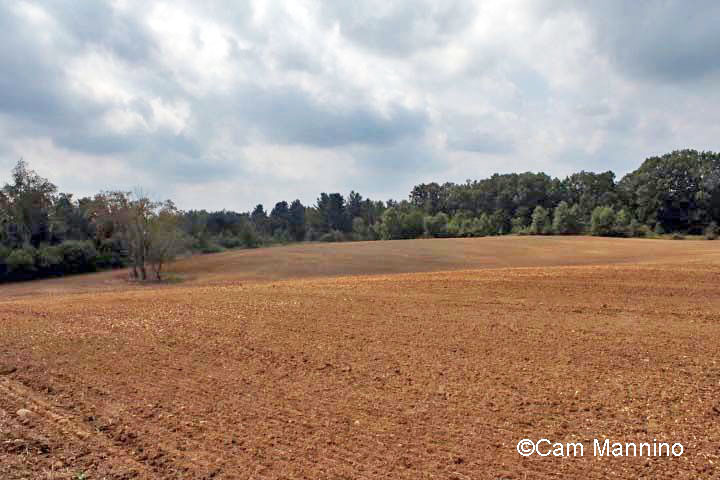 Two other rolling fields of 5 and 13 acres at Charles Ilsley Park were also cleared and prepared. (Click on double photos for larger view. Rest cursor on photos for captions.) Two more 15 acre fields are being prepared for planting in 2016 and 2017. Just part of another 5 acres about to become a prairie at Charles Ilsely Park. Dr. Ben sought out a U.S. Fish and Wildlife grant to purchase wild seed for these areas and then carefully selected a list of plants suitable for our specific sites. Township residents will need to be patient, since prairie flowers spend their first two to three years putting down deep roots. These deep roots help prairie plants survive drought conditions or fire to which they became adapted over thousands of years of fluctuations in climate and periodic fire. 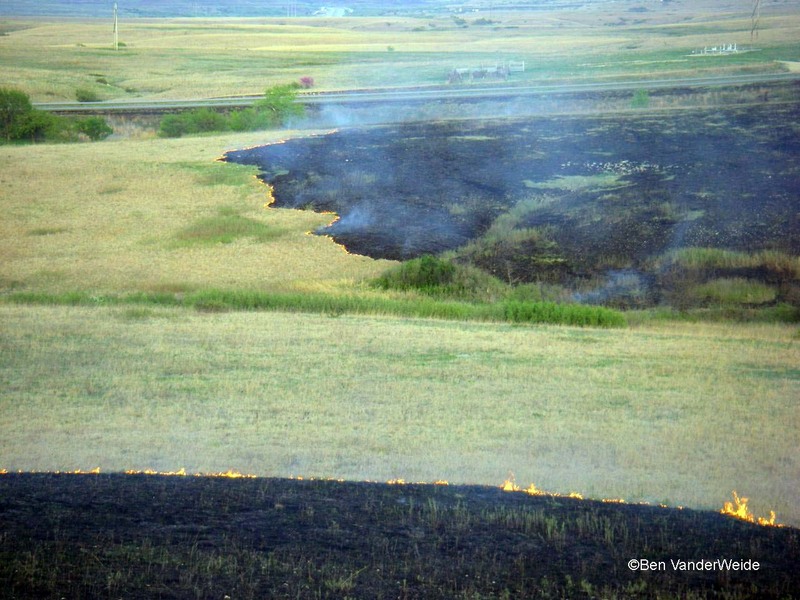 In fact, carefully controlled prescribed burns will be used periodically on these prairies in the future because regular burning helps native plants thrive and thwarts non- natives who are not adapted to it. Some native plants even require fire in order to bloom! Along with these more familiar native plants, Dr. Ben also included grasses and flowers that used to bloom here but that we see less often now. Click on these links to see Foxglove Beardtongue (Penstemon digitalis), Wild Lupine (Lupinus perennis), and Sky-blue Asters (Symphyotrichum oolentangiense). And that’s only a sample of the 36 species of plants Dr. Ben ordered! With those plants up and growing, our parks can attract more butterflies and native prairie birds like those mentioned above or maybe other special species, such as the Northern Harrier (Circus cyaneus), or Henslow’s Sparrow. So that November weekend, Jerry Stewart from Native Connections brought equipment designed for planting native seed. Jerry first carefully calibrated the seed drill for the seed type, planting rate, and depth. He then loaded seed in the hoppers and was ready to go. One of the 20-some bags of wild seed purchased with a grant. Jerry Stewart filling the machine with seed. Taking off for the new prairie site at Draper Lake. The furrows begin to form as the seed is planted. The end of the first turn around the 20 acre prairie site at Draper Twin Lake Park. Four of our former OT stewardship technicians, who had worked hard to clear land for this project, joined Dr. Ben and Parks Commissioner Colleen Barkham (not pictured) to see the moment when the seed finally went into the ground. The former technicians are now finishing up school or pursuing careers in various environmental fields. Now the native seed is in and next spring, sturdy native wildflowers and grasses will begin sinking their roots deep into the soil, a survival strategy that will take them 2 or 3 summers. 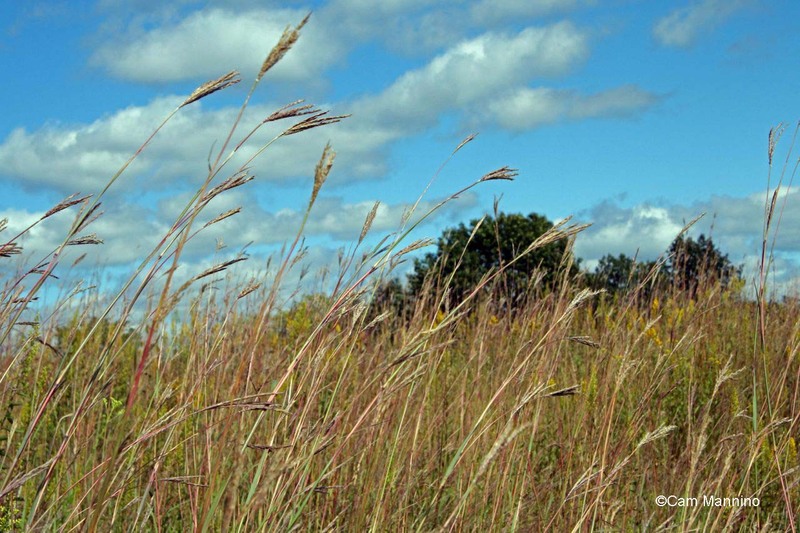 And then in year three or four, we will be able to watch prairies in full bloom again in Oakland Township. As time passes we hope the wildlife return – butterflies floating above swaying grass and native wildflowers, while the Bobolinks sing and the “Bob-White!” whistle returns to grace the summer months. 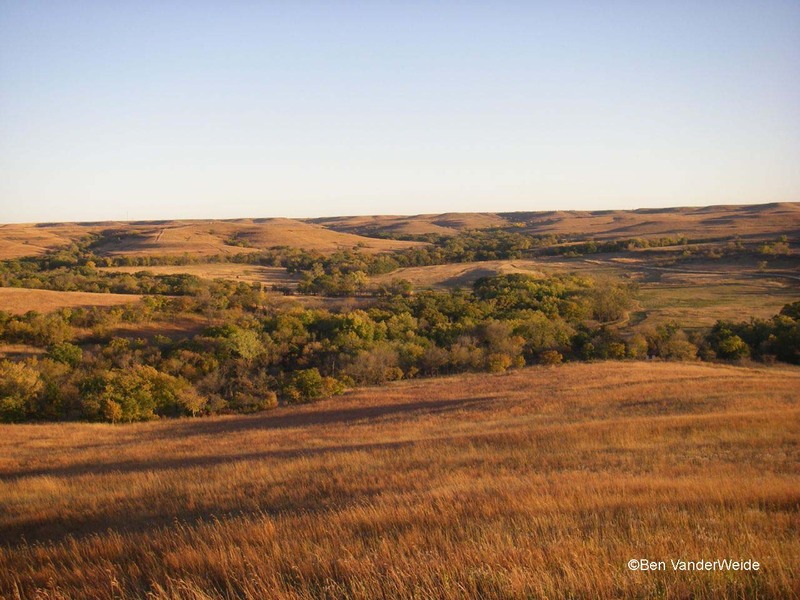 Dr. Ben shared some photos taken on the Flint Hills prairie in Kansas (where he completed his doctorate) in order to help us dream until then. 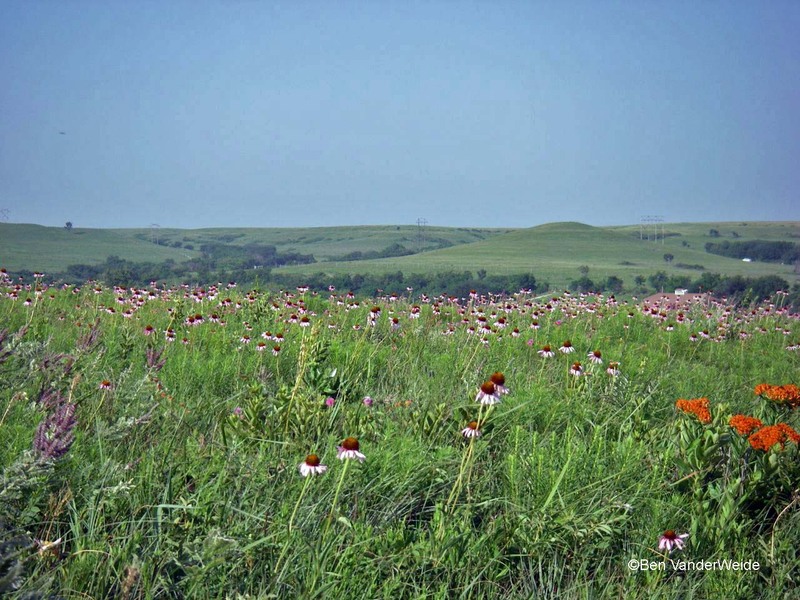 A prairie in Kansas with a huge bloom of Coneflowers the year after a drought! 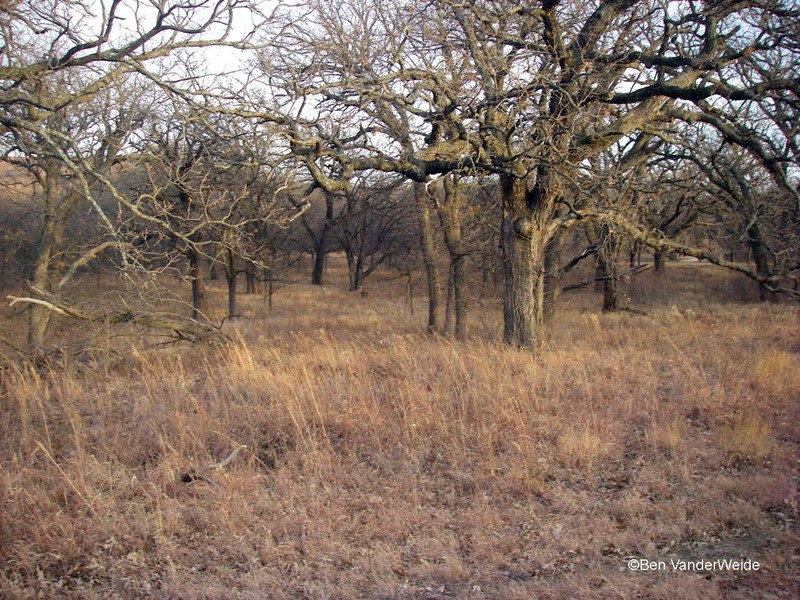 A fall landscape from Kansas shows a “gallery forest” that grows along the streams in Kansas. 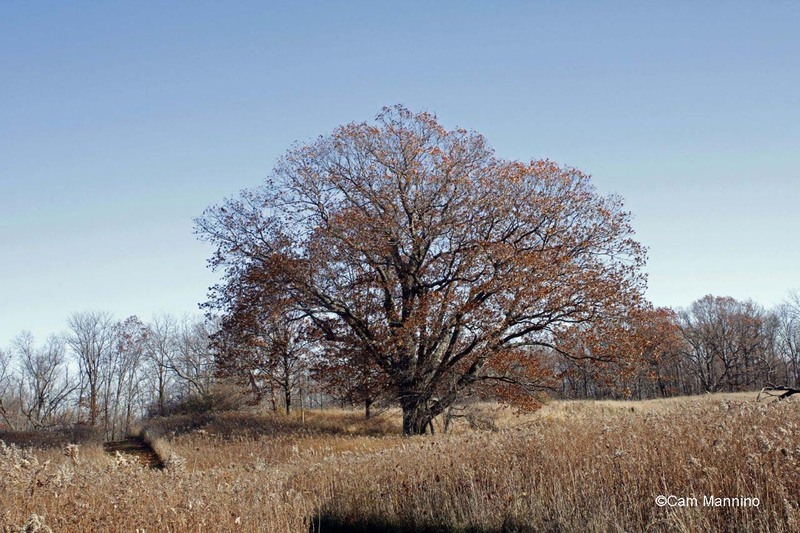 The widely spaced oaks with prairie vegetation underneath give an image of what “oak savanna” or “oak barrens” might have looked like years ago here in Oakland Township. Warm days don’t seem appropriate to November, but we’re happy to have them when the Old Fields darken to russet and the architecture of the trees reappears. The landscape deepens as we can see far into the underbrush to places hidden by summer foliage. The slopes and hollows of the woods are more defined as the understory thins. The skies become even more dramatic in the slanting light of late fall when the vivid shades of autumn fade – or maybe we just notice them more. It’s all about noticing, isn’t it? I wasn’t sure I’d see enough to share this week. How wrong I was! And then she turned around to survey her domain! 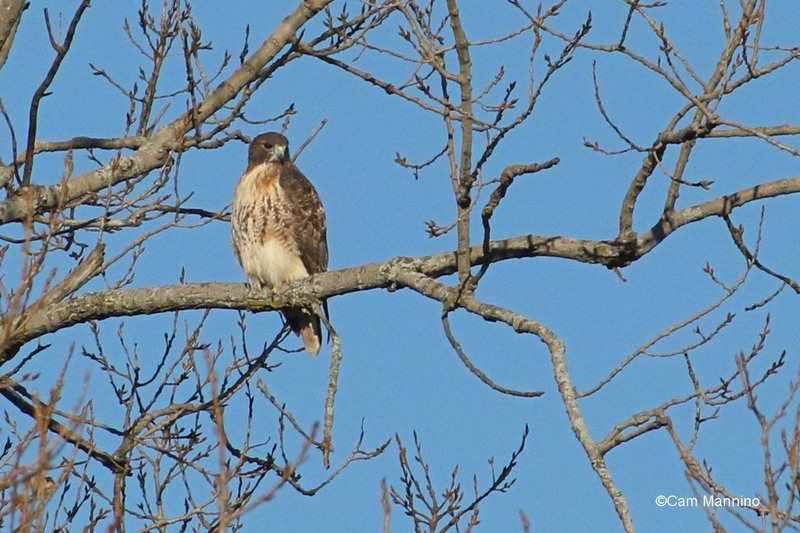 A large Red-tailed Hawk, probably a female, surveys her domain. 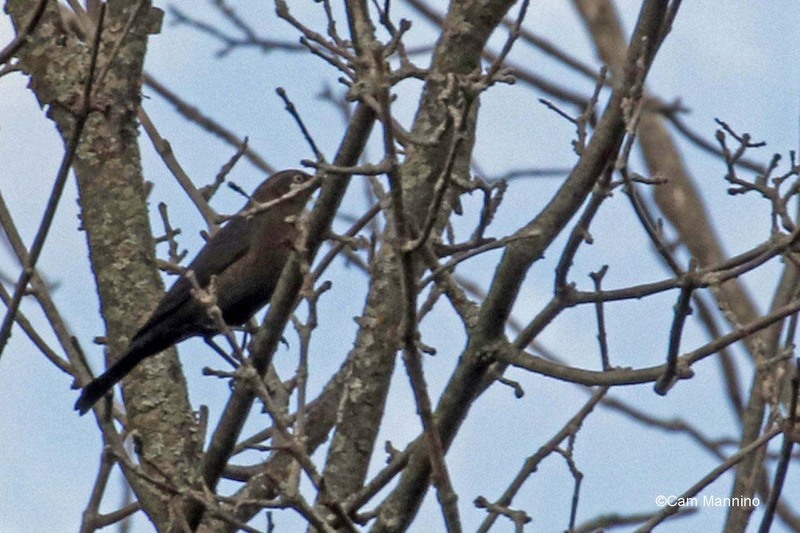 When I arrived on Wednesday, Ben and the birders were watching five Rusty Blackbirds (Euphagus carolinus) at the Playground Pond. I hadn’t seen one in weeks and thought their migration was over. These secretive, shy birds spend most of their time in the shadows at the edges of wetlands, flipping over leaves to look for tiny invertebrates. They land in trees only to pause a second before diving down into the underbrush and skulking along among wet, black mud and leaves. Unable to get a good shot on Wednesday, I lucked out on Friday when I came upon a whole flock (10 or more?) in the wetland below the benches on the southern hill. 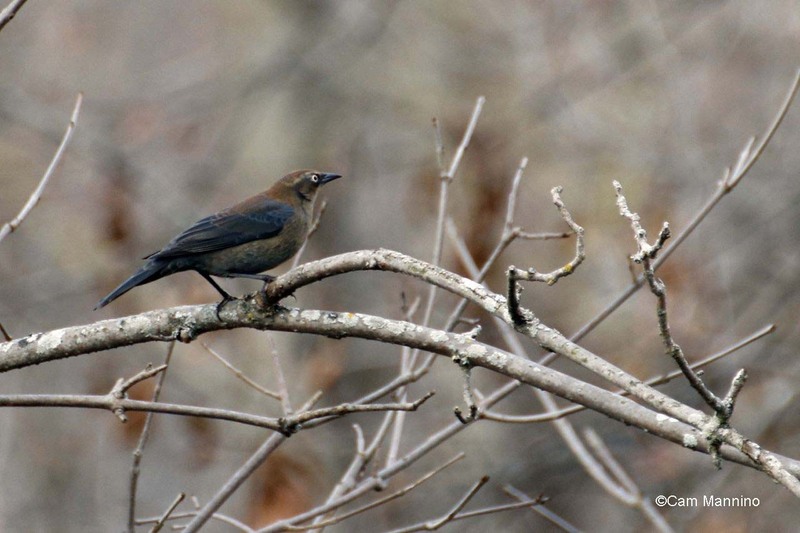 A female Rusty Blackbird posed for a few seconds on a branch in the wetland below the southern hill. Cornell says the population of these birds has “plunged an estimated 85-99 percent over the past forty years and scientists are completely puzzled as to what is the cause.” One theory is that they find fewer wetlands so I’m glad we have several in Oakland Township that they can poke about in before heading south. On the same day (Thursday), a male Red-bellied Woodpecker (Melanerpes carolinus) searched for a crack in tree bark in which to store what appeared to be a piece of nut. 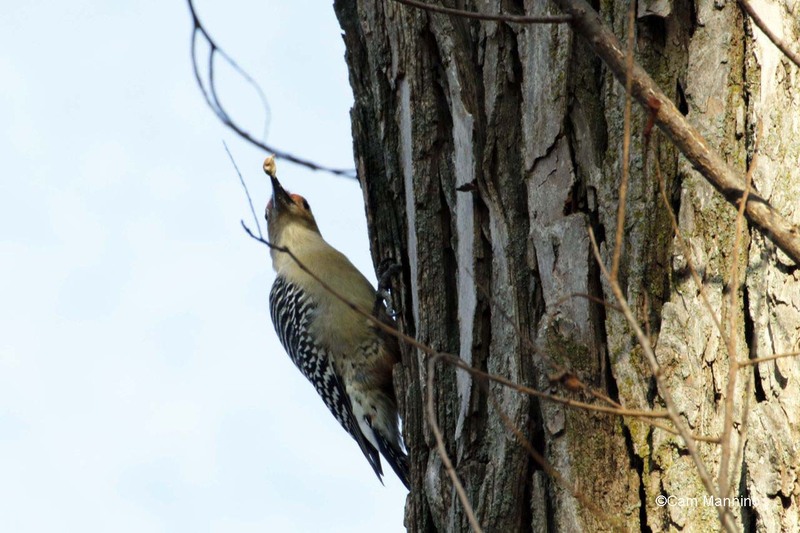 A male Red-bellied Woodpecker looking for a crack in tree bark for storing his piece of (most likely) hickory nut. It could well have been a Shagbark hickory nut since there are lots of them still on the trees, which is where Red-bellies prefer to find their nuts, though they’ll take them off the ground if necessary. Since the nut photo doesn’t show the plumage, here’s a fall picture from a previous year of a male Red-belly. You can tell males from females by the fact that the red back of the head extends all the way to the bill in males but stops at the top of the head in females. 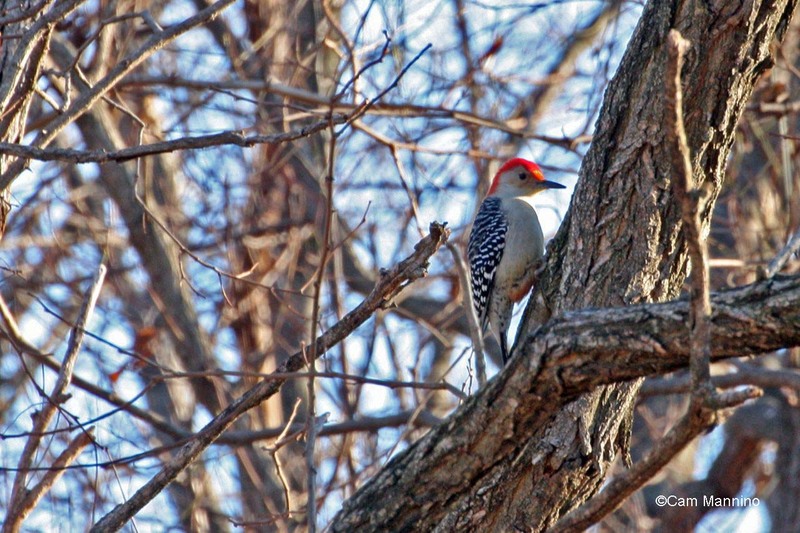 A male Red-bellied Woodpecker has red extending from the nape of its neck to its bill, while red on the female goes only from its nape to the top of its head. 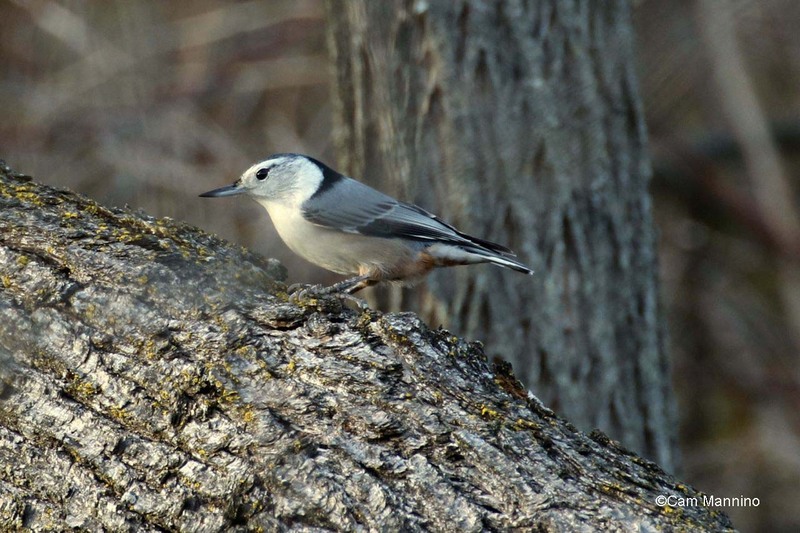 Nearby a year ’round resident, the White-breasted Nuthatch (Sitta carolinensis) repeatedly made its loud, nasal “nyah” call (Cornell calls it a “yank call”)as it probed right-side-up and upside-down around a branch. A very distinctive call! Listen to the “Eastern Call” at this Cornell Lab link. You’ll probably recognize that you’ve heard it before! A White-breasted Nuthatch made its “nyah” call repeatedly as it probed about on a branch. 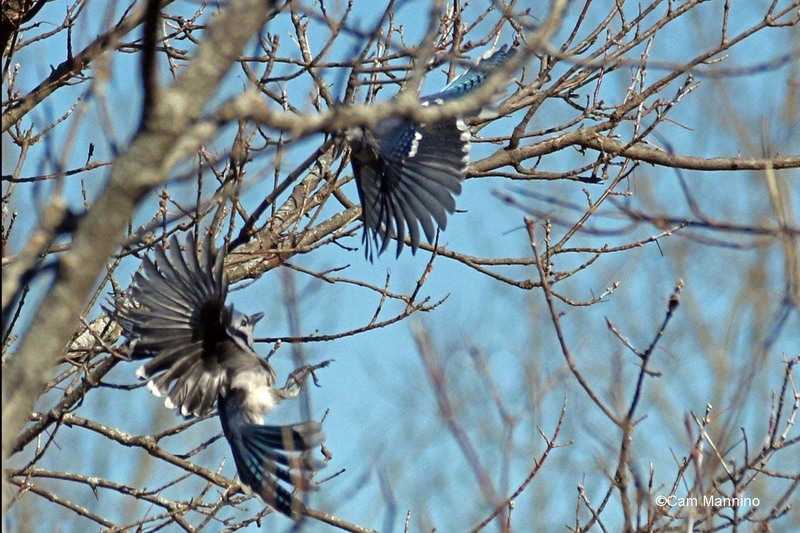 Blue Jays (Cyanocitta cristata) were in a scrappy mood this week, which isn’t unusual for Blue Jays. I saw two repeatedly giving each other a hard time on the western slope earlier in the week. Two Blue Jays playing or fighting, not sure which, on the western slope. 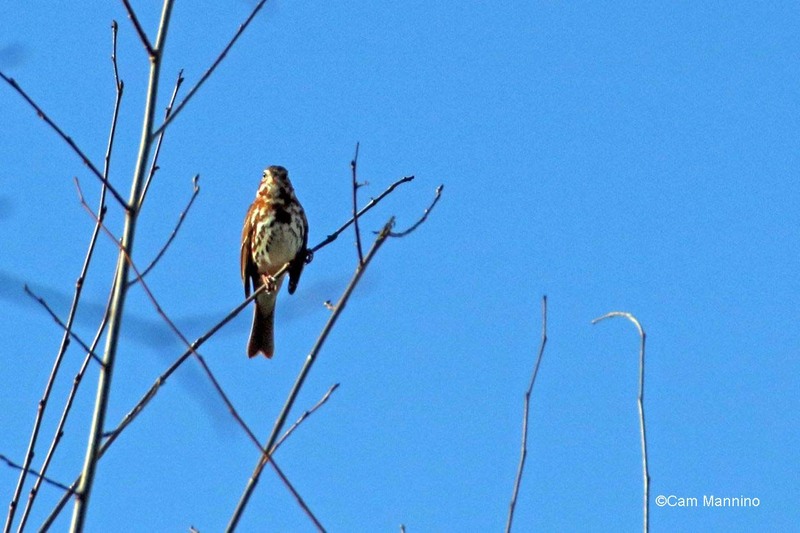 A migrating Fox Sparrow (Passerella iliaca), with its large vivid body, smaller round head and long tail, visited the park again this week on its way south. I thought at first it was a Hermit Thrush (Catharus guttatus) from its vivid color but Ben had it right. A handsome sparrow! We did see a Hermit Thrush but I didn’t manage to get a good photo this week. The Fox Sparrow’s color clearly gave this migrant its common name. 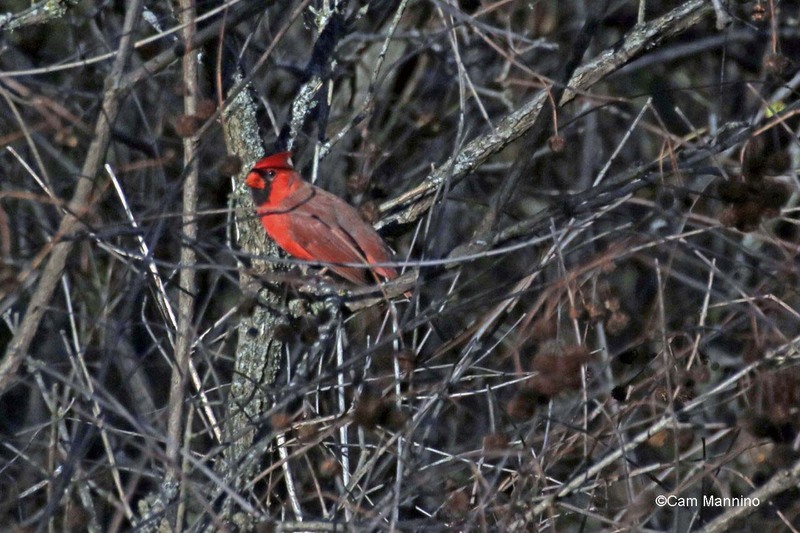 The Northern Cardinals (Cardinalis cardinalis) seem much more secretive this time of year. I’ve seen both the male and female slipping silently from limb to limb down under the Button Bush in the wetland north of the playground – a great contrast to their exuberant singing from the tops of trees and bushes during spring and summer months. This male Northern Cardinal might be a bit disturbed by the presence of us birders, since his crest is slightly raised. More Tree Sparrows (Spizella arborea) are arriving by the day from their summer homes on the tundra. I saw only one near the marsh nearest to Snell Road but I heard what sounded like several in the dense underbrush nearby. 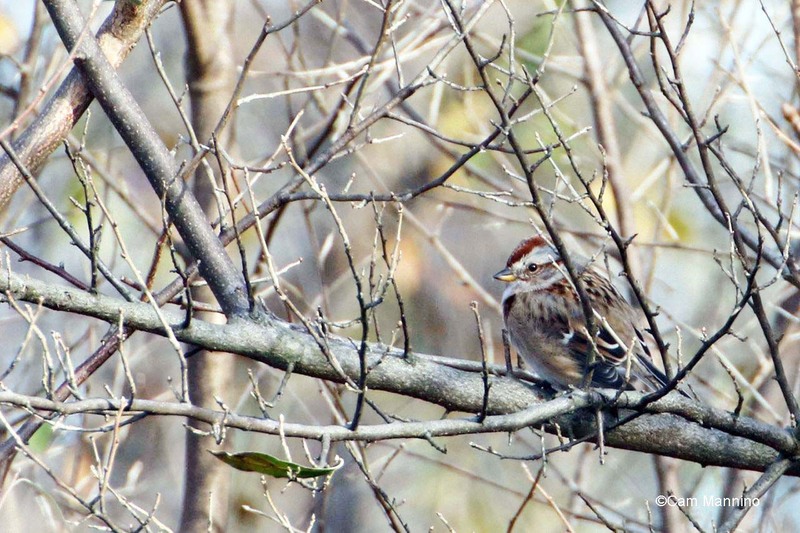 Tree Sparrows continue arriving from the arctic to spend the winter here. Two weeks ago I saw a Muskrat (Ondatra zibethicus) diving in the Center Pond and then appearing briefly as it swam quickly into the shadows near the eastern shore. It looks as though it’s been making modifications to its lodge on the southern shore, as the sturdy heap of pond mud and dead plant material appears to have grown higher and darker recently. Muskrats don’t hibernate but are trapped under ice for months at a time. How do they breathe, find food and keep warm for all that time? We’ll explore those questions later – during a snowy winter week at Bear Creek. 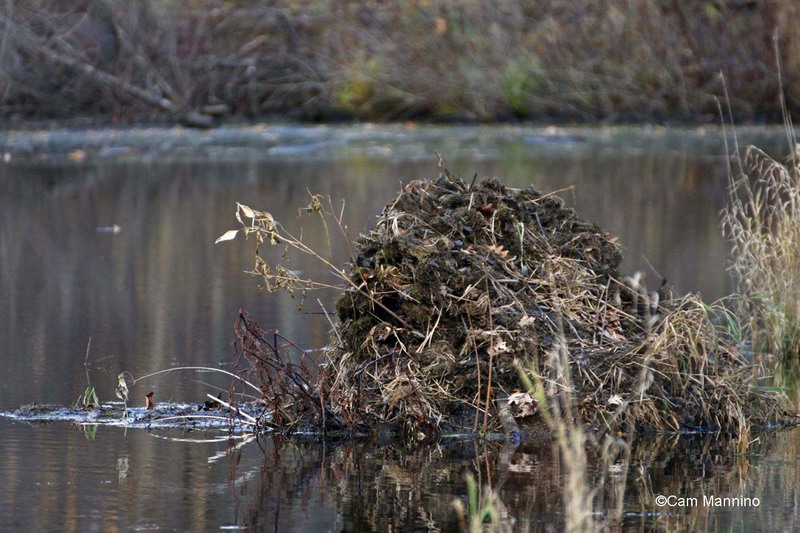 There seem to be recent additions of mud and plant material on the muskrat’s lodge at the Center Pond. 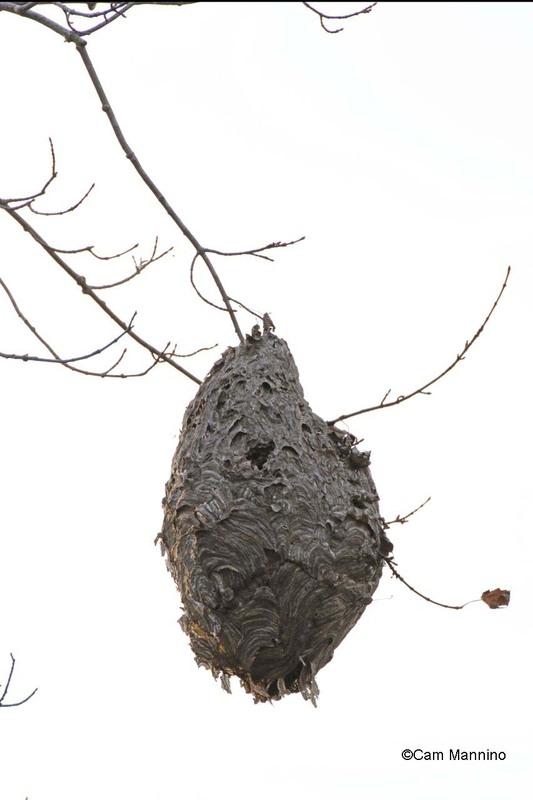 Also at the eastern end of the pond, the beautiful wasp or hornet’s nest swaying at the tip of a slender limb, is fraying at the edges from wind and rain. The colony’s founding queen, workers, males and unfertilized queens have all died by now and all that’s left of that huge colony are the fertile queens who mated this fall. Back in August and September, they put on weight, being fed by the workers. Now they are snugged up for the winter under bark, leaf litter, logs or stumps near the pond where they’ll emerge and start new colonies next spring. And that amazing piece of insect architecture will slowly unravel. A hornet or wasp nest frays at the edges while the only survivors, the fertile queens, hide in nearby nooks and crannies ’til spring. I got another ferocious scolding from an aggressive little American Red Squirrel (Tamiasciurus hudsonicus) this week, who was probably defending itself and its stockpile of nuts, seeds and mushrooms cached nearby. During the winter, they generally live inside logs, stumps or in woodpecker holes, popping out around midday to dig into their food stores cached nearby. Speedy little rodents, Red Squirrels can reach 14mph over a short distance when excited! I told Ben and the birders that if this one had been about 10 times bigger, I’d have taken off running. Look at that fierce little face! An American Red Squirrel fiercely warns me to get away from its winter hole in a nearby tree or log – or perhaps its winter food cache stored nearby. Native wildflowers are almost gone, having produced seed for next year and along the way, fed the honey bees and native bumble bees, caterpillars, birds, even some of the animals in Bear Creek. Up by the benches on the south hill of the park, the gigantic leaves of Prairie Dock (Silphium terebinthinaceum) curl around the bare stalks of these giant wildflowers that grew from 3 to 10 feet high this summer! Prairie Dock nectar fed native bumblebees and perhaps the occasional hummingbird, while goldfinches snacked on the seeds. Now their huge brown leaves curl, reminding me of the caterpillar from Alice in Wonderland. Towering Prairie Dock, 3-10 feet tall, has giant green leaves near the ground in the summer. This dead giant Prairie Oak leaf resembles Alice in Wonderland’s Caterpillar! Across the way, the Black-eyed Susans (Rudbeckia hirta) that turned their faces to the sun a few months ago show only those rich brown centers now. Lots of bees and other insects enjoy this native wildflower during the summer. Meadowsweet (Spirea alba) still sports its red stalk, but the white plumes have fruited into brown seeds for next year. Bees of all kinds fed on the nectar of this lovely plant all summer. Rabbits probably nibbled on the lower leaves while deer sometimes consume the upper ones. Meadowsweet also feeds a variety of native moths, some of which, of course, are consumed by birds. Native plants like these are an important source of nourishment for the birds, bugs and other creatures of Bear Creek. That’s one reason we try to foster them. 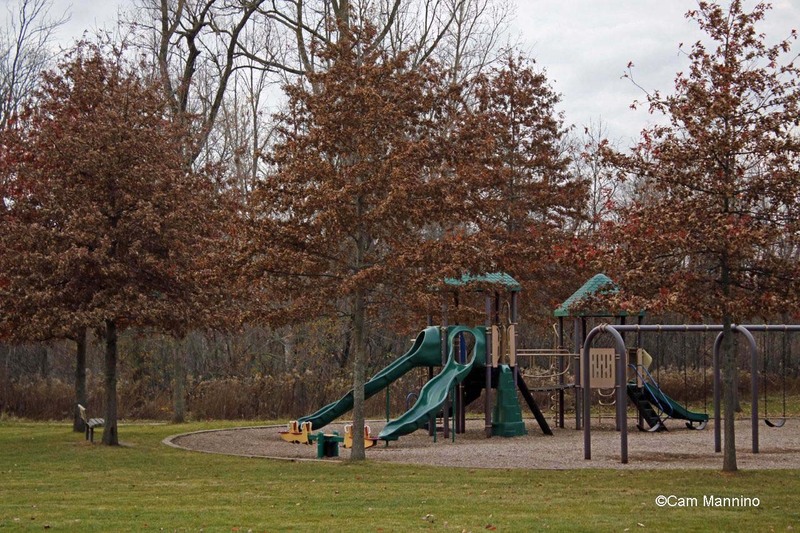 The Pin Oak leaves were bright red and green as they encircled the playground a week or so ago. Suddenly this week, they turned brown but held on. Pin Oaks that were bright green and red last week have quickly turned brown, but held on. A week ago, the Red Maple (Acer rubrum) near the shed blazed a brilliant red but it appears from the pattern of its now-fallen leaves, that a gust of south wind brought most of them down at once . 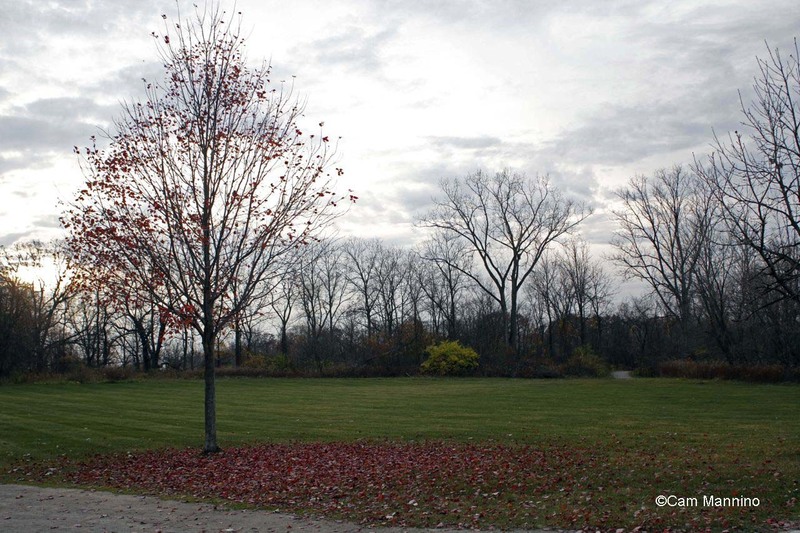 From the pattern on the ground, the Red Maple appears to have lost most of its leaves to the warm south wind this week. Down at the center pond, the giant White Oak (Quercus alba) shed its leaves this week, creating a mosaic in the water nearby. One of the biggest White Oaks in the park, the one near the Center Pond, shed its leaves this week. 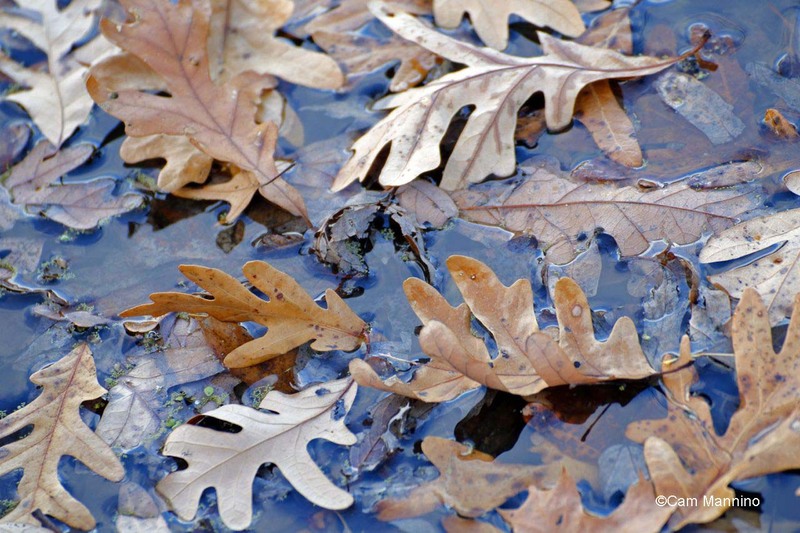 A White Oak leaf pattern in the Center Pond. So despite the fact that November’s fading light cues birds to move on, flowers to wither and leaves to fall, Bear Creek is still a place of beauty and surprise. November cues us too – to don heavier jackets, maybe a raincoat, some days a hat and gloves – to come take part in the changing of seasons. The red tips (pedicles) of Gray Dogwood that are left now that the white fruit (drupes) have fallen or been eaten by birds.